Super Savings Item! 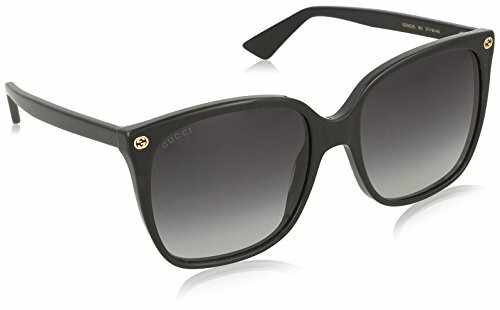 Save 31% on the Gucci Women GG0022S 57 Black/Grey Sunglasses 57mm by Gucci at Sunglasses For Women. SKU: GG0022S_BLACK-57. MPN: 0022S_001 (57 mm). Hurry! Limited time offer. Offer valid only while supplies last. Gucci Sunglasses. Color code: 001. Size: 57. Shape: Cat Eye. Lens Width: 57 mm. Lens Bridge: 18 mm. Arm Length: 140 mm. 100% UV protection. Gucci Sunglasses. Color code: 001. Size: 57. Shape: Cat Eye. Lens Width: 57 mm. Lens Bridge: 18 mm. Arm Length: 140 mm. 100% UV protection. Non-Polarized. Frame Material: Acetate. Frame Color: Black. Lenses Type: Grey Gradient. UPC/EAN code: 889652048123. Gucci Grey Gradient Cat Eye Sunglasses.